Walking up to the DEMO Project space, one is greeted by Gina Hunt’s installation, Suncatcher for the Demolition. Measuring sixty inches wide, the piece consists of fiberglass mesh, spray painted red, blue and green, and wrapped in a diagonal pattern over a wooden frame. The work’s name, as well as its location—hanging from a beam on the front porch—remind of the unique circumstances surrounding the gallery. 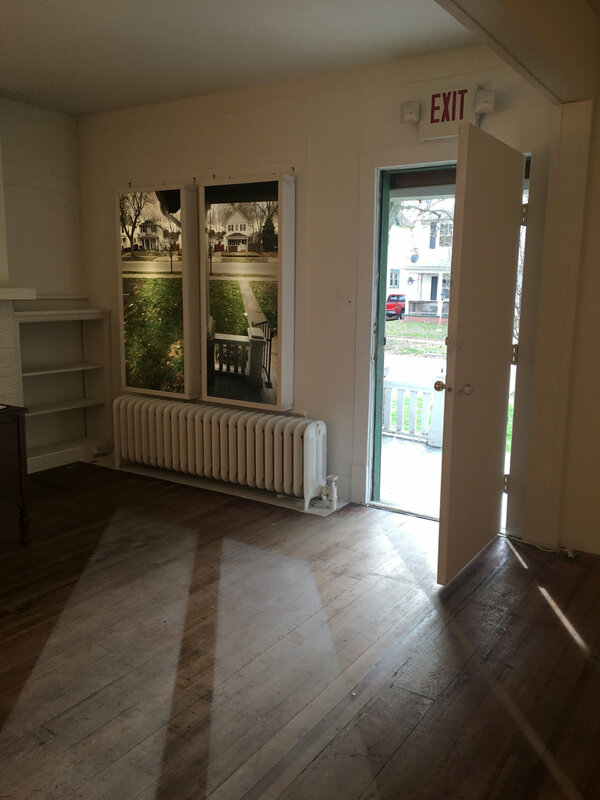 Once a private home, the space was donated by the Springfield Art Association for use as a venue for contemporary art. The site is named so because the offering came with an expiration date. As the red “x” featured in Hunt’s work seems to signal, the gallery is slated for demolition in the near future. In this unlikely setting, Melissa Oresky’s curatorial effort, Weight of Light, brings together the work of five artists attempting to tease, from the ephemeral, something lasting. Oresky writes of the project, “These works suggest that the interaction of light and substance is specific and complicated—dirty, tactile, thick, solid, or even dark. The works in Weight of Light hold and bind light to phenomena in a way that approaches permanence.” Oresky orients the work in opposition to a longstanding association between light and the immaterial in Western history. Opal Hours, one of two featured paintings by New York based artist Angelina Gualdoni, is brightened by large areas of bare canvas. Surrounded by stains of violet and dark applications of orange and blue, the raw material appears to glow in a way that rivals the illusionistic glazes of Baroque masters. Beside it hang four pieces created by Vincent Como that together are titled Doom Patrols. Each is varied in scale and composed of black aluminum foil that has been creased and bent. Even on the darkest of fields, the ambient light throws the surface into relief to reveal a texture of ridges and valleys. The back room of the gallery is occupied by Oresky’s own work, Succulent Succulent. A screen on one wall displays the silhouette of an agave plant, composed of a series of looped videos that capture light as it interacts with water, plant, and sky. 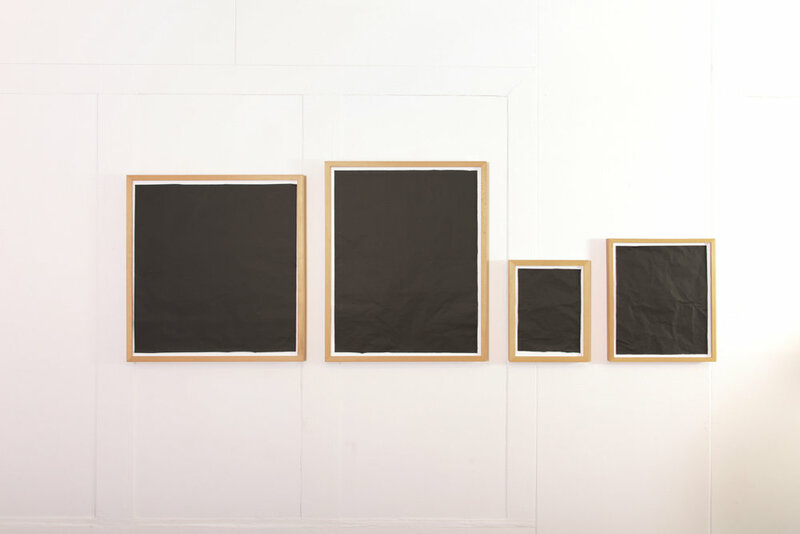 The video and its collaged counterpart hanging opposite, invite the audience to view light through the receptors of a different type of organism. That is, not just as a source of wonder and spiritual invigoration—as it often appears to us in art—but of physically substantial energy that can be harvested and transformed. With chalk marking paint and backlight film, Paola Cabal orchestrated her own kind of light capture in her site specific installation, Backlight. Beside the gallery door hang three lightboxes that illuminate composite photographs of the outside as it would be seen through the now walled off windows. At the foot of each lightbox, as well as the doorway, Cabal has painted on the hardwood floor the elongated shape of sunlight on a bright afternoon. At once, time is frozen and rewound, as the living room view that once was, remains fixed from dawn to dusk. At 3:30 in the afternoon, the sunlight passes through the open doorway at nearly the same angle as the painted forms; but beside the warm glow of the present moment, the chalk takes on a certain dullness. The comparison is enough to remind why the pictorial tradition Oresky refers to could be so fixated on the romance of light—why it afforded the phenomenon a supernatural significance. Because paint does not offer illumination itself, it only reflects back something inimitable in its presence. At 4:00, the room has tilted even further from the sun. By night the chalk will continue to catch the light of the fluorescents, but the sun beams won’t return until tomorrow.